NOTICE: Activation key must be used on a valid Steam account. Requires internet connection.About the game	A unique blend of space sim, RPG and 4X games. Conduct research and construction in your own gigantic space station, command your war fleets and heroic companions to invade enemy territory, build up your stronghold, trade, mine, salvage and remind your enemies why they fear you. 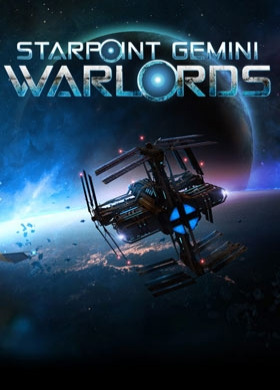 Starpoint Ge… mini: Warlords is a unique blend of space sim, RPG and 4X games focused on larger ships, ranging from gunships to carriers. Command your starship, send your war fleets into enemy territory, lead your heroic companions into battle, build up your stronghold, trade, mine, salvage and remind your enemies why they fear you.Humans, fleeing from the ruined Solar system trickled into Gemini in rag-tag convoys, their ships barely holding together. Planet Phaeneros, located in the farthest reaches of the Gemini system, abandoned long before Gemini gained its independence, will become their new home... your new home. You should prepare for what's coming, captain. The Solari Concord needs you!TWO MODES OF PLAYThe campaign mode continues the story from Starpoint Gemini 2 after the Gemini Protectorate and its allies managed to fend off the Brotherhood threat. The Empire, both in their mainspace and in Gemini have been wiped out. Only small pockets of resistance remain. Progress through the storyline at your own pace and make difficult choices along the way, changing how the storyline will ultimately play out. The conquest mode is for the freeroamers. Strip away the campaign, but leave everything else and you have yourself the conquest mode. Create a story of your own and completely change the face of Gemini! COMMUNITY DRIVENWarlords is a spin-off to our successful space sim Starpoint Gemini 2. The majority of the planned features and implemented ideas came directly from the SG2 community. All the things asked about and requested that we simply couldn’t implement in SG2, are now integrated into Warlords. And these are not minor features. We’re redoing entire sections of both gameplay and the underlying game engine. Key Features Massive game world, populated by over 60 diverse factions, ready to face your war fleets. Campaign mode – Play through the story of the “exiles”, who settled on the barren planet of Phaeneros on the outskirts of Gemini, after escaping the alien invasion of the Sol system. Five free roam scenarios with distinct start setup. Choose among nearly 90 different ships, from gunships and corvettes to bulky carriers. Build your own personal headquarters to boost your economic and military power. Procedurally generated freelance jobs offer a great way to earn Credits that you can use to pump upgrades into your ship. Procedurally generated encounters can creep up on you when you least expect them. Choose one of three unique character classes or whip up a hybrid class of your own. Conduct research on a multitude of different tech that affects everything from your own ship to the global scheme of things. Construct ships, assemble war fleets and send them in all directions to conquer for the glory of the Solari Concord. Build and upgrade infrastructure across the star system to improve resource gathering and strengthen your dominion. Engage in diplomatic relations and sign trade deals to get that boost you need. Mod support that greatly surpasses that of its predecessor, Starpoint Gemini 2.System RequirementsWindows - Minimum OS: Windows 7 or higher (64 bit) Processor: Intel Core 2.6 GHz or equivalent Memory: 4 GB RAM Graphics: 1024 MB Direct3D 11 capable video card DirectX: Version 11 Storage: 10 GB available space Sound Card: DirectX compatible sound card Additional Notes: The minimum requirements listed here are PRELIMINARY and are subject to change!Starpoint Gemini Warlords © 2017 Little Green Men Games. Developed by Little Green Men Games. Licensed exclusively worldwide to and published by Iceberg Interactive B.V. All brands, product names, and logos are trademarks or registered trademarks of their respective owners. All rights reserved. Made in Europe.